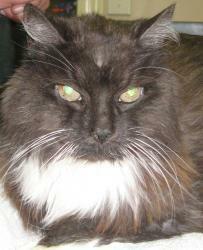 Boots, a 15 year-old female spayed, grey and white long haired cat, presented to us early November 2010. Her owners said she had not eaten in 3 days and had no bowel movements in 2 days. On presentation she was about 10% dehydrated, 1.5lbs lighter than she was in Aug 2010 and her temperature was a full degree below normal. She was started on IV fluids and warmed on a heating pad. Blood work and x-rays were performed to try and find an answer as to why she was not eating or passing stools. Her blood work came back normal – not bad for a 15 year-old kitty! On x-ray normally the liver sits underneath the ribcage in cats, but on Boot’s x-rays more of her liver was visible past her ribcage. This finding could be caused by an abnormal liver, a mass on the liver or an enlargement of another organ in that region of the abdomen (stomach, pancreas). The next step was an abdominal ultrasound to get a better look at the liver, stomach, pancreas and intestines. The ultrasound showed a normal liver and pancreas but Boots’ stomach and adjoining small intestine were very dilated with fluid. Just past this dilation of intestine a mass was visible in the intestinal wall that appeared to be obstructing the passage of food. The rest of Boots’ abdominal ultrasound was normal and no other masses were found. Boots’ age and the location of mass indicated it is was most likely cancerous. The owners wanted to go ahead with abdominal surgery to remove the mass. They understood with Boots’ age and condition she was at a higher risk of complications under anesthetic. Radiographs of her chest were taken prior to surgery to ensure the cancer had not spread to her lungs which would worsen her prognosis. Her chest was clear. Boots was very stable under anesthetic and her surgery went well. Her entire abdomen was checked first for any other abnormal findings but none were found. The mass within the wall of the intestine was removed along with 2 cm of intestine on either side of the mass. Boots recovery was smooth and she was sent home with her owners 2 days after her surgery. The intestinal mass was sent away to the lab for diagnosis and came back as a low grade lymphoma. The lower the grade of the cancer the slower it is to grow and less likely to spread to other organs. Boots’ owners have been great at giving us regular updates. Within a few days after going home her appetite was much better and she started having bowel movements again. Boots recently celebrated her 16th birthday and her owners say that she is doing fabulous! Good appetite, regular bowel movements and back to her old tricks.